Venture House is located at 220 East 13th Ave in Vancouver. Prior to its closure it was operating as a 24/7 Mental Health and Substance Use short-stay, crisis stabilization program for Vancouver residents (19+), who have an existing Vancouver mental health team and stable housing. Venture is now temporarily closed for renovations. This temporary closure has created a unique opportunity for VCH to assess what needs could be filled when the building is ready for occupation. A three level residential building (basement, ground floor, second floor) with 20 individual bedrooms averaging about 9’x9′. Five bedrooms are on the ground level and are wheelchair accessible. Near these rooms is a wheelchair accessible bathroom with accessible shower. There is a large living room on the ground floor with a two-fixture non-accessible bathroom adjacent to it. Also on the ground floor are a dining room (seating 20), a professional grade kitchen with a large gas range, two dens (ie., reading/interview/exam room), a staff office and reception area, small medication room. On the second floor are 15 bedrooms, one den (reading or video room), and 4 three fixture bathrooms. The second floor is not wheelchair accessible. In the basement are two large client use multipurpose rooms (ie, art activities, groups, fitness activities with treadmill and stationary bicycle, large screen TV/video machine), a conference/meeting room, a two fixture bathroom, laundry room with 2 washers & 2 dryers, a staff room with bathroom and shower, and two small office rooms. The basement is not wheelchair accessible. There is a small deck and patio area off the dining room, currently not usable, which may or nmay not be retained after the renovations. There is a covered patio area at the rear of the house. There are five dedicated parking stalls at the rear of the house. The front entrance of the house is wheelchair accessible, the rear entrance is not. 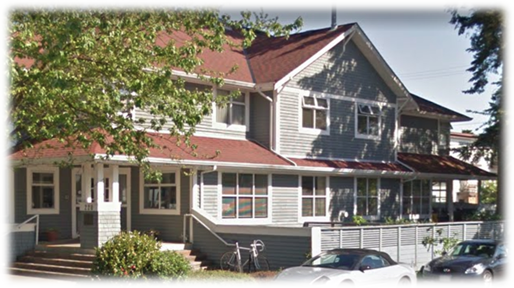 Venture was a residential, twenty bed, emergency, psychiatric facility, part of Vancouver Coastal Health Mental health & Substance Use Services. It provided a unique blend of services to facilitate crisis resolution and endeavored to prevent hospitalizations and maintain client autonomy in a safe, supportive, supervised environment. Venture’s services included: Individualized Treatment Plans, starting Clozapine (an antipsychotic medication), electroconvulsive therapy (ECT) pre and post care; family oriented care, and access to community mental health services. Services were provided to adult Vancouver residents who were attached to a mental health team. Other services included short term assessment, crisis counseling, medication adjustments, and stabilization. Its 24 hour staffing model consisted of Psychiatrists, a General Practitioner, Registered Nurses, Registered Psychiatric Nurses, Health Care Workers, Administrative Staff, Cooks and Housekeepers, all of whom strove to foster a home-like atmosphere in which clients were active participants in crisis resolution and treatment. Venture aimed at a flexible response to clients’ psychosocial needs; to the ever increasing demand for quick discharges from hospital (sometimes referred to as “step-down”); and to the desire to prevent hospitalization (sometimes referred to as “step-up”.) Admission to Venture was voluntary. Venture was a time limited program, with an expected stay of 2 – 3 weeks. It was a Licenced care facility and regulated by the Community Care and Assisted Living Act. It could accommodate five persons who need wheelchair access. If you would like more in-depth information, including some research on best practices and a floorplan, please contact Sue.Macdonald@vch.ca or Isabella.Mori@vch.ca.